EVERY WEEK, WE take a look at the best comments left by you, our lovely readers, onTheJournal.ie. 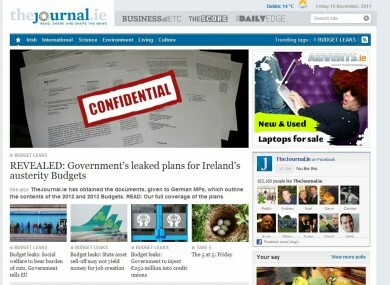 This week you’ve been talking about those leaked Budget documents in the German parliament, Ireland qualifying for Euro 2012, the killings in Bandon, whether Irish people are too apathetic, Mick Wallace’s plans to move the Dáil holidays so TDs can watch the football, why the US Congress ruled that pizza can be considered a vegetable – and much, much more. Some day, I’d like to be rich and crazy enough to slag off a newspaper I own in the pages of another newspaper I don’t own. You’ll find that most addicts are second or third generation addicts. There are stuck in a vicious cycle. The fact that they take drugs is not the problem to the wider society. It’s the crimes they commit to feed there habit. Heard the idea voiced some time back .. excellent idea. Why not start a trust so we can “buy a plant” for the garden. It would probably be the most cost effective option to change a derelict into a functional piece of architecture and would be far greener than demolition. My reaction, much like waiting on a scheduled Dublin bus service on a wet day: Finally. Is the tomato classed as a fruit? So a pizza is a vegtable because it has tomato sauce and a tomato is a veg because its on a pizza?I’m guessing the kids are winners in the end though, who needs fruit or veg they have pizza – which is now both! The government should be considering reducing VAT by 2% not increasing it. I feel like this every day of the year. There’s something seriously a miss with us, have we as a people no backbone to take a stand? On anything? In the “good times” people took a stand for themselves, now in the bad times can we not make a stand together? Well done lads. Great to have the country back on the big stage. I think were punching above our weight in terms if size and talent. No place like here for the big game sessions. I’m hoping Esso bring back the silver coins with the faces of the players on them that fit into the green fold out holder, The Star has a sticker album, Jacobs bring back the plastic hammers, some company has the pics of the players faces on them with the sucker thing so they can be stuck to windows and we see some glass milk bottles to commemorate the occasion. If I’m missing anything 1990ish feel free to add…. Dublin can learn one lesson from Leinster and its that Success on the pitch increases attendances at games and participation. This in turn breed more success. They have just regained the All Ireland championship and if this is promoted in the right way it will lead to more success in the future. Craig Doyle is what would happen if Sean Moncrief was designed by a committee. Email “Top 10 readers’ comments this week”. Feedback on “Top 10 readers’ comments this week”.